Christmas in Paris: 11 Festive Places to Celebrate! Christmas in Paris is one of the most magical experiences you can have in the world. Each neighborhood celebrates Christmas in its own special way but there are certain places in Paris that you absolutely cannot miss during the holiday season! 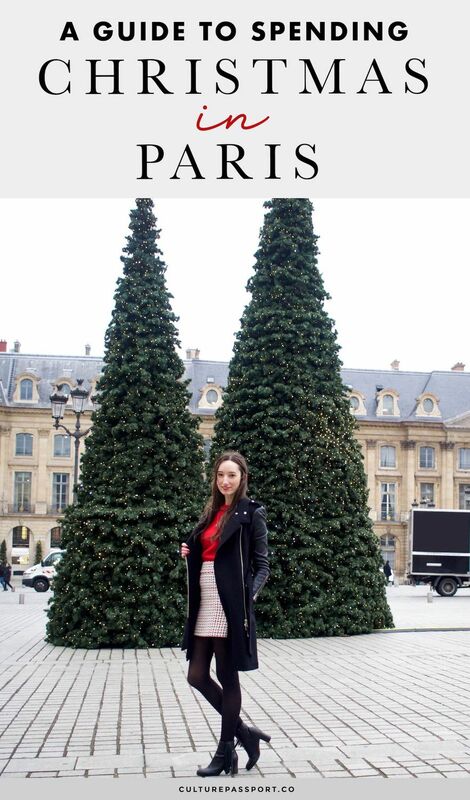 What is Christmas in Paris like? France is a traditionally Catholic country, and the many churches and cathedrals in Paris will likely hold a service on Christmas day. If you’re visiting anytime Paris during December, you’ll certainly be able to partake in Christmas festivities. From the outdoor ice skating rinks, to the department store decorations, there is sure to be a Christmas tradition you’ll enjoy in Paris. Generally speaking, finding Paris Christmas lights and decorations isn’t hard at all. Most neighborhoods put up lights and lots of businesses decorate inside and out for the holiday season! 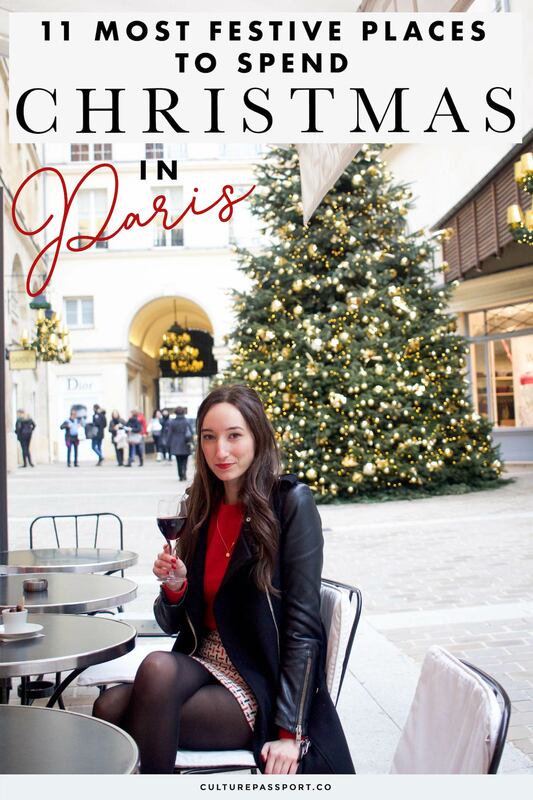 Here are the ten best places I recommend you visit during your Christmas in Paris! 1. Place Vendôme – Place Vendôme is my favorite place to visit during Christmas in Paris because it’s equally magical during the day time as it is at night! Giant cone-shaped Christmas trees are placed in every corner of this beautiful plaza. They illuminate at night creating one of the most magical scenes you can experience in Paris! Take a short walk south to admire the Louis Vuitton store, which decorates its building façade every year for Christmas! 2. Village Royal – Not far from Place Vendôme and La Madeleine church is a tiny side street known as the Village Royal. Every year the carless passageway puts up a large golden Christmas tree and green garlands, creating a lovely Christmas atmosphere you’re sure to enjoy! 3. Galeries Lafayette – The Galeries Lafayette is well known for their Christmas display windows which can easily rival those of New York City! Inside, a creative Christmas decorations are hung from the enormous ceiling so you can see them on each level. When I visited in November, there were already lots of people squeezing through the shops on each level to catch a glimpse of the decor from above. 4. Le Bon Marché – Another department store worth visiting during Christmas is Le Bon Marché on the left bank! This year, the store hung numerous lighted Christmas trees from the ceiling! 5. Notre Dame – A large Christmas tree is placed in front of the entrance to the famous Notre Dame Cathedral every year. It’s the perfect place to take a holiday portrait to send to family and friends back home! 6. Champs-Elysées – The wide boulevard of the Champs Elysées is decked out with beautiful string lights every year. Be sure to check out La Magie de Noël, the city’s most central Christmas market in the Jardin des Tuileries. 7. Champ de Mars Christmas Village – If ice skating below the Eiffel Tower sounds appealing to you then be sure to head to the Champ de Mars Christmas Village this December! Small wooden chalets sell Christmas crafts, decorations, and regional products your family and friends back home will love. 8. La Sainte Chapelle – La Sainte Chapelle was the personal place of worship for French kings during the Middle Ages and today you can enjoy a Christmas concert in this beautiful royal chapel. 9. Hôtel de Ville de Paris – At the Paris city hall, you’ll find a giant outdoor skating rink and a lovely Christmas Market to peruse for Christmas gifts! 10. St Germain des Prés Christmas market – The Christmas market on the left bank, in front of the St Germain des Prés church runs all December long! 11. Gare de l’Est – While the train station may not be your first through when it comes to Christmas celebrations, there is a wonderful Traditional Alsace Christmas market held here beginning on December 5. It makes sense as Gare de l’Est is the train which takes you east to the Alsace region! Paris has many of its own traditions when it comes to celebrating Christmas. One very special tradition is to eat a Galette des Rois – or “King’s Cake.” In this tradition, a cake is made with a small “fève” baked inside. The cake is cut up and served to everyone. The person who receives the slice with the “fève” is the King for the day! Santa Clause, or the Père Noël, as he is called in French, is just as loved in France as he is in the US! While more of a winter tradition, drinking vin chaud, or “hot wine” in Paris is a must if you’re visiting in December! While snow is rare in Paris, there is a chance you could spend a White Christmas in Paris! More than likely, the weather will be very cold. Prepare for below freezing temperatures at night, and comfortable but chilly temperatures during the day. I recommend packing all your normal winter accessories: a windproof and waterproof coat, winter boots, a thick scarf, winter gloves and a warm hat!